Whoop I've made a card!! .....OMG you have no idea how much I have missed paper...lol!! Knitting is fun but time consuming & so far I have made 4 characters & 2 to go!! I have made this card this morning. A request from my mum. I have been loving looking at everyones fabby cards in this style & decided I needed to have a go!! Don't forget to watch or set up your sky plus for this Monday. to see the first of my knitting!! Hello there Helen. How are you. I love your card, it is just brilliant. Fab image and I just love the design of it. Happy Crafting. Hi Helen was wondering where you had gone lol, knee deep in wool!! 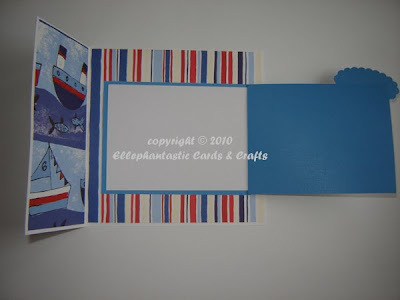 Love your card, great fold to use for such a great colourful card. 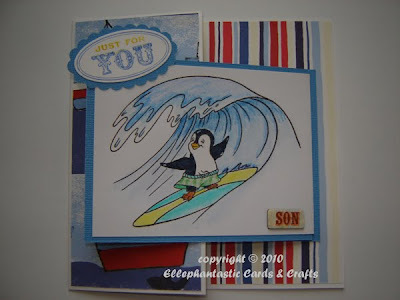 That image would so suit my son, he loves surfing. Please send email reminders for your fame appearance on Monday. Looking forward to seeing your knits!